Trunk control (a.k.a. core stability) is a critical determinant of physical performance and is key to proper injury avoidance and rehabilitation. While physicians, physical therapists, athletic trainers, coaches, and personal trainers all believe that “strengthening your core” is important to help avoid injuries across the entire body, there is little rigorous scientific basis for this belief. Perfect Practice has built that scientific basis and the system designed to improve core strength. That system is now available for your use in multiple applications like baseball, golf, and physical therapy. Core stability – the control and strength of the body’s back, abdominal and hip muscles – is essential to achieve maximum athletic performance and also to reduce injury risk. This innovative device, created by an Ohio State University Sports Medicine team, is a breakthrough in core stability testing and training. Measures core stability while the athlete is positioned in a sports-specific posture, rather than the more typical lying position counting abdominal crunches or maintaining a modified push-up, called a “plank.” For a pitcher, the device measures the athlete’s ability to keep the body properly aligned while going through the range of motions needed to throw a baseball. 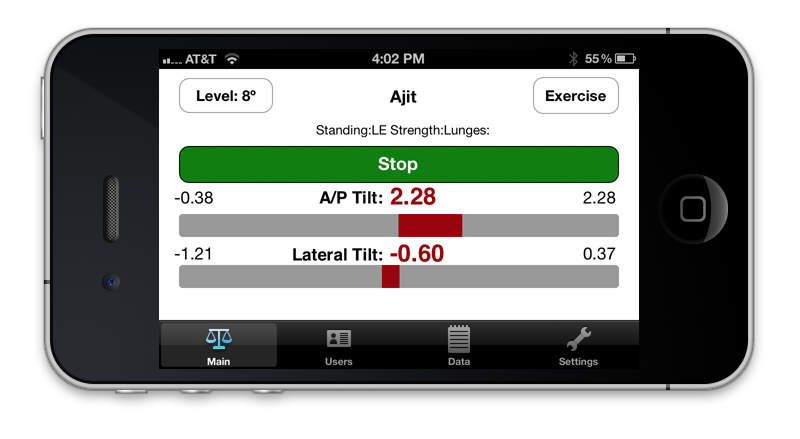 Home screen for the Level Belt Pro app showing tilt in both anterior/posterior (A/P) and medial/lateral (Lateral) directions. Provides real-time feedback so that the athlete or patient is immediately alerted when the body is not correctly aligned during an activity. Alert options can include a bell tone, buzz, vibration or other sound that could be delivered through a headset. 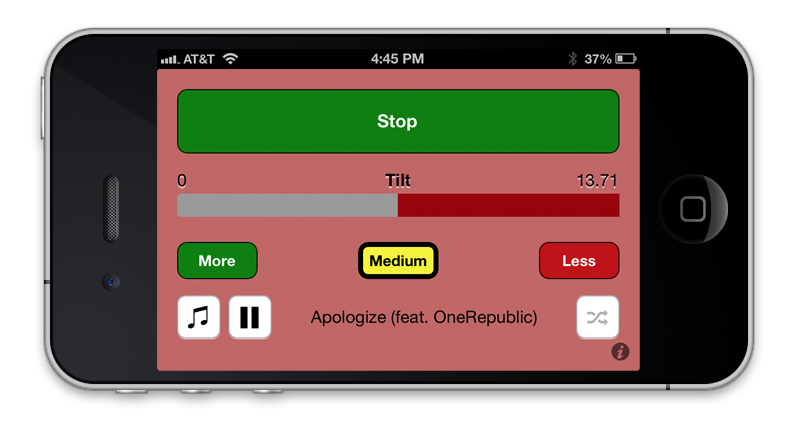 Level Belt Lite app showing visual feedback for exceeding the “Medium” threshold. Audible feedback is also given unless the device is silenced. Choose music from your library to play during your workout, and your audible feedback plays over the top of your music. Supports training and re-education of the neuromuscular system, which helps the user learn to maintain correct body position as a reflex action without having to think about it. Contact us to learn how you can bring Perfect Practice to your organization!